Have you ever heard of cliff diving? It is one of the most amazing extreme sports that you could participate in. In my person opinion, it combines everything that an extreme sport should offer: free falling and water. There is no bigger adrenaline rush than cliff diving, feeling the air fly through your hair whilst you plummet towards the water. 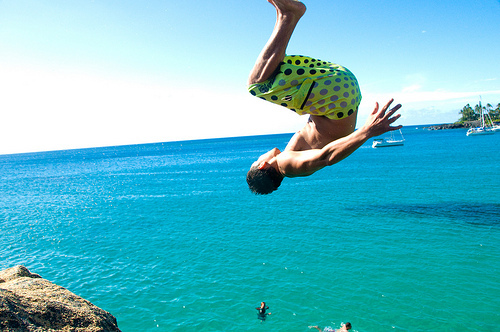 Officially, cliff diving is diving into water whilst performing perfect acrobatics. The cliff has to be of a pretty good height, of course. Hence, it is more than simply jumping off a high cliff: you need to also do some acrobatics whilst you’re in the air. Cliff divers basically brave strenuous climbs to get to the top of the cliff and then experience one of the ultimate adrenaline rushes: one false move and you will hit the water as if it was a slab of concrete. 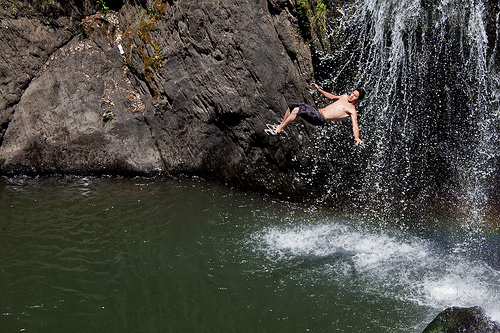 Cliff diving originally started in Hawaii, on the island of Lana’i. Records exist of the first cliff dives in 1770. The king at the time – Kahekili – required that men dove off a cliff, hitting the water feet first, without making a splash. This would demonstrate that they were courageous and loyal to the king. Cliff diving looks really easy, particularly for beginners who are not quite ready to do the acrobatics involved in it. It looks as if you simply pick a high rock and jump off. The reality, however, is that it requires great skill and training. Of course, a diver will also need a great deal of self confidence, courage and physical control. It is also incredibly important to have lightning speed reaction times as a lack of focus and not being able to make a decision in less than a second could really make the difference between life and death. Those taking part in it must at all times remember that it is a very dangerous sport. It is unlikely that your health or travel insurance will cover you for accidents sustained during cliff diving, so do think of this. However, as it is now a recognized sport, standards have been set in order to make the dive not just safe but also valid. This means that men should jump from between 23 and 28 meters and women should jump from anywhere between 18 and 23 meters. The speed of entering the water should be between 75 and 100 kilometers per hour, allowing for a free fall of around three seconds. Very little in terms of equipment is needed, generally only a good swimming costume, some water shoes and – of course – a first aid kit for those who are near the water waiting for you. 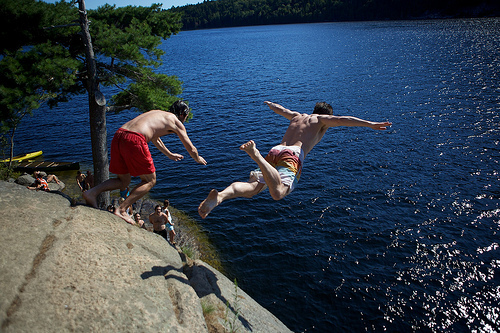 Generally, cliff diving is done in areas that have calm waters. This is, in part, because calm waters are generally deeper and have no rocks near the surface that are disturbing the water. It is important for a cliff diver to do a thorough examination of the area in which they are trying to land, to make sure that there is no risk of hitting an obstacle as this will usually mean instant death. This entry was posted in Cliff Diving, Water Sports and tagged Cliff Diving. Bookmark the permalink.